Let tenants contact you first. OfficeSpace.com allows users to search without restrictions for all types of commercial space. With over 200,000 unique users and 3.5 million building views every month, tenants use OfficeSpace.com to connect with brokers as they actively search for space. 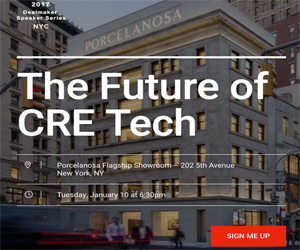 OfficeSpace.com is making their fourth appearance at CRE // Tech. Our team at CRE // Tech recently caught up with OfficeSpace.com to learn more about their site, strategy and vision. Officespace.com is a nationwide service that connects brokers representing office, retail, and industrial properties to tenants who are actively searching for the right space based on their business needs. As a completely free and open platform, users can search OfficeSpace.com without restrictions for all types of commercial space nationwide. OfficeSpace.com services prospective tenants, brokers, and landlords. The top leading CRE brokerages, as well as thousands of other firms across the country, advertise on OfficeSpace.com. Over 1 million buildings are currently listed on the platform. Additionally, third-party data shows that tenants who search OfficeSpace.com are savvy business people in the legal, finance, professional and retail fields. They hold senior level titles or function in their operations departments. Unlike other platforms, there are no pay walls for users to search and brokers can add their listings for free. Hundreds of thousands of valuable tenants use OfficeSpace.com every month to connect with brokers as they search for space. 75% of users are not yet represented by a broker and have the intent to execute a lease. 68% are searching for spaces over 1,000 SF. Brokers and landlords can upgrade to a Featured Listings to maximize their exposure. On average, Feature Listings receive 16x more leads than standard listings. OfficeSpace.com also offers Tenant Connect, a program designed specifically for Tenant Representatives. This marketing service allows Tenant Rep brokers to prominently put themselves in front of active tenants searching in their market. OfficeSpace.com tracks over 200,000 unique visitors and tens of thousands of broker-to-tenant connections every month. Last year, these users recorded over 40 million building views on the website. Brokers in over 50 markets across the nation are growing their pipeline with OfficeSpace.com’s Tenant Connect. The average partner sees a 4x ROI. OfficeSpace.com launched a syndication partnership with Colliers International Group Inc., expanding its listings database across the US. This partnership marked the first time a leading global commercial brokerage firm syndicated its listing data to a CRE listing service. We plan to continue expanding our nationwide listing database. Our goal is to provide better data transparency for tenants while optimizing CRE data management for brokerage firms. The recent OfficeSpace.com-Colliers partnership was a huge milestone for the industry, and we’re actively working toward additional syndication partnerships with top brokerages around the country. We hope to continue this type of partnership with every firm. Come meet OfficeSpace.com at CRE // Tech Intersect San Francisco on June 8th and follow them on twitter @OfficeSpace, Facebook or Instagram!